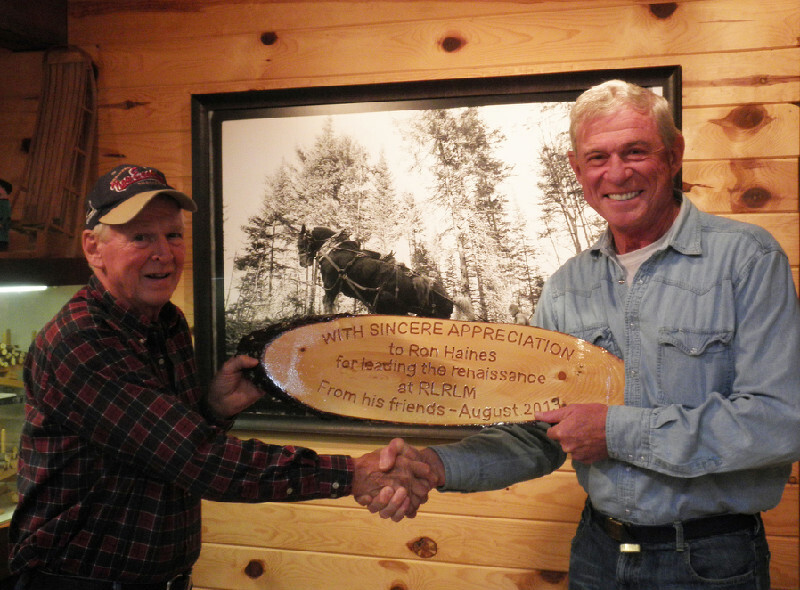 The Rangeley Logging Museum welcomed their new president, Ken Astor (R), at the August Board of Directors’ meeting. At that time, Ron Haines (L) took on the title of “Past President” after a three-year term that might have set records in this town for amount of projects completed per season for one organization! Anyone driving by or visiting the Logging Museum in the last few years can testify that the outward appearance has improved dramatically. This can be credited to Ron Haines’ devotion to this organization, his boundless energy, and his ability to motivate volunteers! The list of improvements is too long to list here but it’s worth the visit to see it for yourself. The Museum’s new President, Ken Astor, of Rangeley and Falmouth, Maine, has had his initiation into the organization by being one of Ron’s work crew volunteers as well as lending the Museum his portable saw mill which facilitated making, among other things, all new stadium seating and a multitude of benches for the Festival grounds and trails this year.